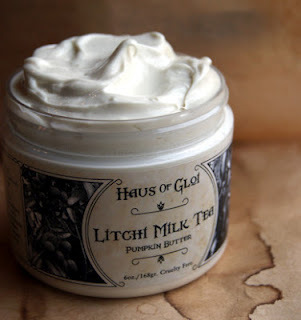 I have no idea why I didn't talk any sooner about Haus of Gloi because I've been using their products for about a year. I think it was my friend Kate aka the Driveller who recommended them at some point because I was complaining about my temperamental über dry skin during the course of last Winter. Haus of Gloi is a small indie business owned and run by two vegans who have a passion for bath and body products. They pay a lot of attention to the quality of their products, which are made in small batches so you always get them as fresh as possible. All products are, of course, 100% vegan (honey frangranced ones are made with synthetic fragrance, no bees involved). "Our Pumpkin Butter formula is divine intervention for the skin. Made with shea butter and unrefined pumpkin seed oil this moisturizer is rich without being too greasy." And let me tell you, if you are dry skinned and/or are a fan of body butters in general, you are going to ove these! The Pumpkin Butters are very nourishing but they penetrate the skin quite fast and they don't leave a sticky residue at all. I have no issue spreading this all over my legs right before going to bed, I never feel greasy or sticky after applying. These butters come in a very large variety of scents, inspired by the nature or the season or whatever was in the creator's mind. All their names inspire me nothing but deliciousness : Honeysuckle Lemon Curd, Litchy Milk Tea, Moodong (a mix of coconut, dry sandalwood essence, heated with nutmeg and clove) and many many others. If fragranced products aren't your thing, there's one completely unscented version called Aether that will be perfect for you. What I liked these the most for, though, since I'm eternally lazy with body moisturizers, is to use them as hand creams. Lavender Sugar is my favorite for this purpose as it's very calming to use at night and the smell isn't too strong or overpowering at all. You can buy either 2 oZ samples for $4.50 or 6 oZ full jars for $10. I think the small jars are a great format to keep in your bag, to travel with, or to use as a hand cream. And of course, Haus of Gloi ships internationally. I've never heard of this brand before but I'm definitely going to have a look now! Me and my husband love them too, I'm especiially fond of the foodie scents - we're using Vice right now!